Make your classroom bright and cheerful by displaying a beautiful array of butterfly sun catchers on your windows. You’ll need transparency film and sun catcher paints for this project. The sun catcher paint gives the best results, but you can use permanent markers also. You’ll find the directions for making this project, “Butterfly Sun Catchers” in the 5th Grade Projects Gallery in the right sidebar. 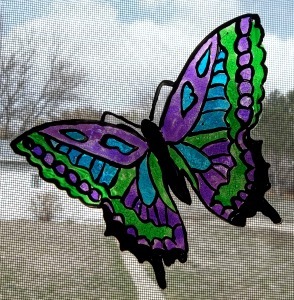 This entry was posted in Categories and tagged 5th Grade, butterflies, butterfly, butterfly art, butterfly crafts, butterfly sun catchers, easy butterfly crafts for kids, suncatchers, transparency, transparency film. Bookmark the permalink.